Mitten State Sheep & Wool : So it Begins! Here is the first lamb of 2014, a 13 pound Tunis Ram. He had a pretty rough start. When I was pulling up to the house, I noticed something small behind the barn. I slowed down the car-it was dark red, but still couldn't tell what it was. It took a minute before I realized it was a lamb. What was a lamb doing behind the barn? 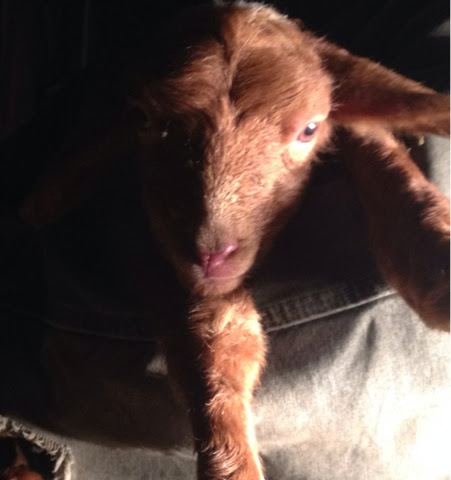 I hurried up the drive and ran into the barn to find an upset mama ewe trying to open the barn door. I made my way over and sure enough, her lamb was on the other side of the door. There is a small opening at the bottom of the door and he had managed to fall out! I fetched the little guy and put him and mama in a stall. He is having a hard time figuring out the nursing thing. We have been having to assist. We normally do not have to do that. We are cutting him a break since he had such a rough start in life! We are hoping he will be okay when he gets warmed up. To help that along I am making him a lamb coat using a sweater sleeve from the wool sweaters I have been felting. I am hoping he will be nursing and bouncing around in no time. 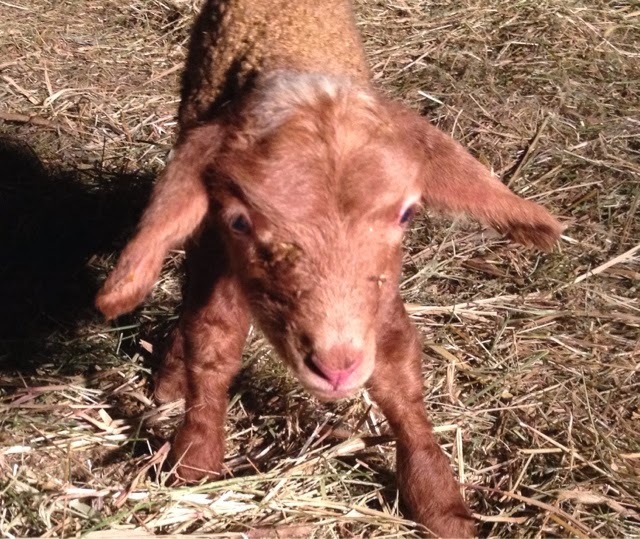 So starts the 2014 Lambing Season! Congratulations on your first lamb this season. Hoping the little guy will grow healthy and strong. Oh he is so cute! I hope he gets along well after his rough start in life. You are taking great care of him! Poor little thing!!! But he is a cutie. Hope everything goes well. Cute. I do love lambs. Hope he gets a chance to get warm and stays strong. That is a rough way to come into the world. Oh my what a precious face! I do hope he makes it! Good luck! That's so sweet that you made him a little sweater! What a cutie! Awww, he is so sweet! I'm cheering for him. What are you going to call him ...Houdini!! Ack! Too cute!!! I didn't realize they were SO red when they were born. Cute, cute, cute. Oh, good luck! If cuteness was the solution, he would be just fine!